Since I mentioned Rusty yesterday, I thought I'd introduce him to the Typoshpere. If the Consul 232 was my Garbo, then this is my Bogart, rough and tough. I can't really explain what happened at the estate sale. There were around 200 machines filled in four rooms, most all had fresh ribbons and paper in them from people testing it all weekend. I bounced around all the rooms looking for the perfect typer, but wherever I went, I saw this guy being moved from room to room, table to table, table to floor, corner to corner. No one wanted it and it kept getting shuffled from one place to another as things were being sold in the room. I finally went to it when I found it on the floor after the desk it was on was sold and carried off. It was like that stray dog hiding in a corner at a rescue. I lifted it up on to the table and examined it. The ribbon was missing and the vibrators were rusty. I turned it over and there were some rust spots but nothing that looked like destruction. I tapped all the keys and it seemed to work. Then I decided to find a ribbon and test it out. It typed. There wasn't much time left in the sale so I decided to buy it even though it had no case. I thought the worse case scenario, I could put it on my bookshelf as an ornament. But when I got home I actually really enjoyed typing on it. I could live with the extra help it needed to feed the paper. 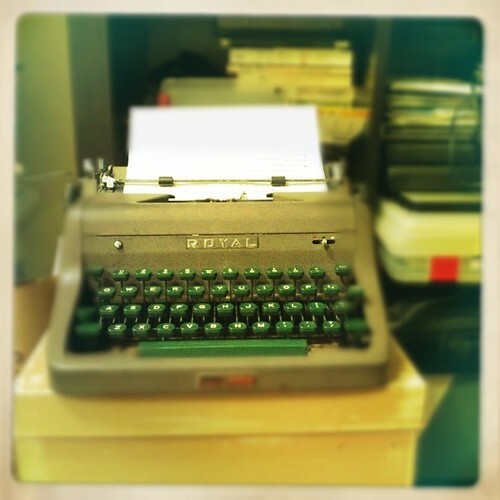 Of all my typewriters, I have the most bond with this one. Maybe because it sits in my room without a case so I see it everyday. The initials J.D.N. (or J.O.N. ) is carved into the space bar. And there is a Walker's Office Supplies label underneath it based in Fairfield, Iowa. I know I can date the machine with the serial number online, but what gets me the most, is the label's telephone number. It's two digits: 73, which reminds me how old it actually is. Nice find! These Royals never show up here in Switzerland. Pity. That is too bad, I actually really like these models. They fit my typing style. I haven't actually typed on a bad one yet. You do have plenty of Hermes which I've only recently gotten hold of a 3000 and it's impressive, but I need more time with it. Btw, where in Switzerland are you? I use to go through the Zurich airport a few times a year as a child enroute to Africa where my father worked via Swissair. Loved that airline. I loved the toy store right outside in the mall. I think it was an FAO swartz, am I right? But this was a long time ago, in the 80s. What an interesting story! One of the more fascinating aspects of it is that there were 200 machines at this estate sale? That in itself is remarkable and unusual. Must have been a SERIOUS typewriter collector. 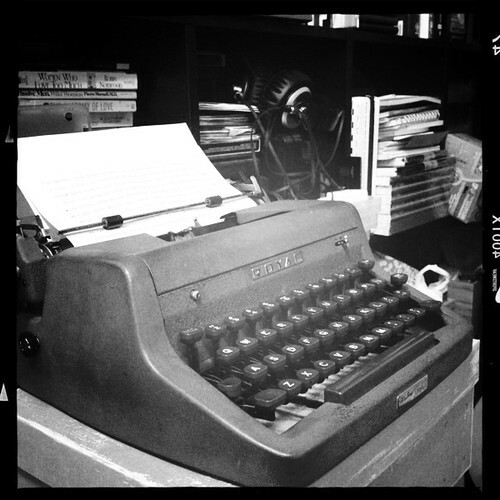 I know exactly what you mean about having an emotional connection with a typewriter. That's the way I feel about an Underwood Universal that I just spent 2 weeks cleaning. It's got character!